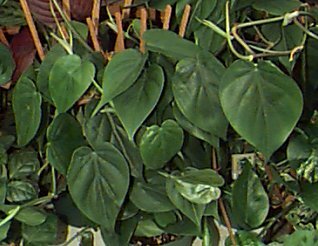 In the USA, whereas overdoses of iron supplements is the most prevalent cause of pediatric adverse reactions reported to Poison Control Centers, due to children's tendency to explore their world through taste testing and putting items in their mouths, inquires relating to house plant toxicity are the most common child-related call to Poison Control Centers. Scopolamine, competitively binds to (muscarinic) acetylcholine receptors at both peripheral (heart, salivary and sweat glands, GI tract), and central neuromuscular receptors. Deadly nightshade, mandrake. Gastrointestinal irritants Anthraquinones are important irritant substances which significantly alter gastro-intestinal motility. Bitterweed, colorado rubberweed, copperweed. Toxalbumins Toxalbumins are Phytotoxins that inhibit protein synthesis. Castor beans contain the toxalbumin ricin, and jequirity beans contain abrin. Castor bean and rosary pea, jequirity beans. Description: Climbing vines with aerial roots. 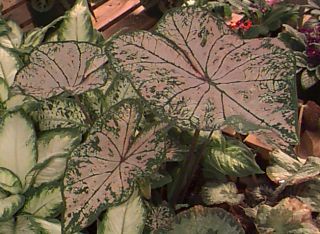 Leaves large and variable, the most common being heart-shaped. Symptoms: When ingested, causes painful burning of the lips, mouth, tongue, and throat. May also cause reddening and inflammation of the skin, and itchiness. 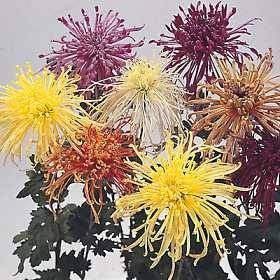 Common Names: Chrysanthemum, Daisy, Feverfew, Marguerite. Description: Showy flowers in almost all colors except blue. Toxic Parts: Leaves and stems. Symptoms: Skin contact may cause dermatitis. Toxic Substance: Sesquiterpene lactones allergens. 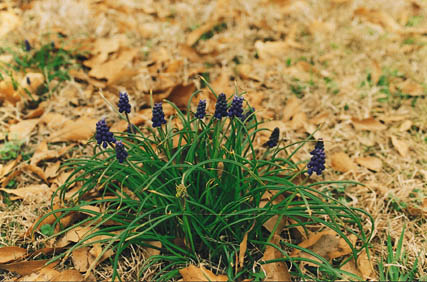 Scientific name: Hyacinthus orientalis . Description: Bulbous herbs with long, narrow leaves, often has flowers of white, yellow, red, pink or blue.. Toxic Parts: Leaves, juices, and hyacinth bulb dermatitis. Symptoms: Ingestion causes stomach cramps, nausea, vomiting and diarrhea. Toxic Substance: Oral toxicity due to alkaloid, bulb dermatitis caused by oxalate crystals. Description: Evergreen, semi-evergreen, or deciduous shrubs with a variety of colored flowers. 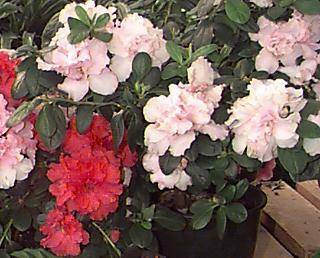 Common Names: Azalea, Rhododendron, Rhodora, Rosa Laurel, Rosebay. Toxic Parts: Leaves and honey made from the flower nectar. Symptoms: Burning in mouth, salivation, and diarrhea may occur. Toxic Substance: Andromedotoxin, arbutin glucoside. Toxic Parts: Leaves, roots, stems.. Symptoms: Ingestion can cause severe irritation to the mouth and throat, may also be an irritant to stomach and intestines. 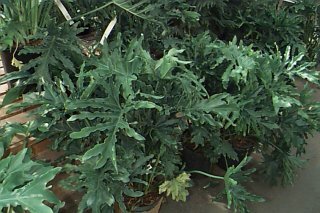 Description: Erect, biennial herbaceous plant with soft oval, hairy green leaves that form a rosette. Clusters of pink-purple, tubular-shaped flowers, forming capsular fruit containing very many small seeds. 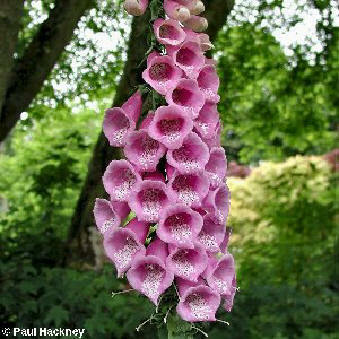 Common Names: Foxglove, dead-men's bells. Toxic Parts: Leaves and seeds. Symptoms: Nausea, severe vomiting, advanced heart rhythm disturbances, tachycardia, and ventricular fibrillation. Toxic Substance: Contains digitallin and other glycosides which stimulate heart action. Has a very bitter taste so humans usually avoid ingestion. When ingestion occurs, outcome is often fatal. Description: Evergreen shrub or small tree with thick, gummy, clear sap; leaves opposite or whorled, simple, leathery, with smooth margins and conspicuous pinnate veins; flowers clustered at tip of twigs, 5-parted, funnel-shaped, white, pink, red, or yellow. Toxic Parts: All parts - green or dry. Symptoms: Extremely toxic - a single leaf is considered potentially lethal to humans. Symptoms begin several hours after ingestion, and include dizziness and drowsiness, increased pulse rate, cold extremities, abdominal pain, nausea, weakness and vomiting. Toxic Substance: Nerioside, oleandroside, saponins, cardiac glycosides. Description: An evergreen tree 1-20 meters high. Leaves are dark green, shining, hard, thorny on the young branches. 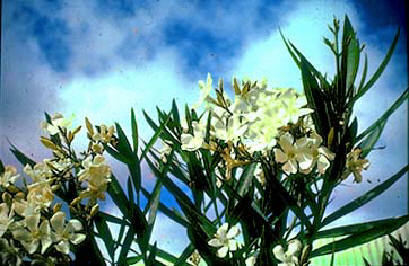 Flowers are small, white, rosy, fragrant; situated at the base of the leaves. 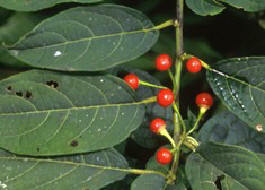 Fruits are bright red or yellow berries of 8 mm diameter. 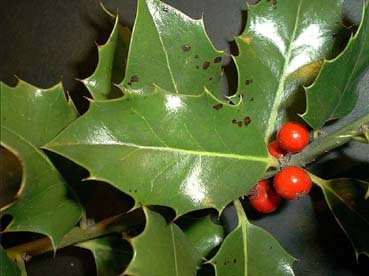 Common Names: European holly, English holly, Oregon holly, sparked holly, Christmas holly, crocodile holly, prick holly, common holly. Toxic Parts: Leaves, bark, berries contain active principles; no information available on roots. Symptoms: Ingestion of berries may cause nausea, vomiting, abdominal pain and diarrhea. Stupor and drowsiness have been seen in children after ingestion of large quantities of berries. Although lethal cases have been reported in older literature there are no recent reports of severe poisonings. Ingestion of Ilex aquifolium berries is mostly associated with gastrointestinal symptoms. Toxic Substance: Contains several toxins: saponin, phenolic compounds, terpenoides, sterols, alkaloids, anthocyanines. The exact mode of action is unknown. The gastrointestinal symptoms may be due to the saponin. However, no specific toxin responsible for the symptoms has been identified. . Toxic Dose: Ingestion only route of poisoning. Hospitalization may be required if large amounts have been ingested. Intoxications are almost exclusively seen in children after ingestion of berries from Ilex aquifolium cultivated in parks, gardens, or when branches with berries are used ornamentally in homes. Description: Shrub with alternate, simple leaves; flowers 5-parted, white; fruit a bright orange-red (or rarely white or yellow) berry. Common Names: Jerusalem cherry; christmas cherry; tom thumb; winter cherry. Toxic Parts: The toxin is found throughout the plant but especially in the unripened fruit and leaves. Symptoms: Nausea, vomiting, salivation, drowsiness, abdominal pain, diarrhea, weakness, and respiratory depression. 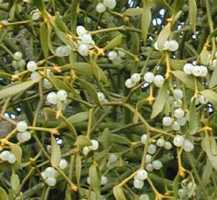 Description: Mistletoe is a partial parasite growing on many types of trees. Its toxicity may vary depending on the tree it grows on. Common Names: American and European Mistletoe. Toxic Parts: Leaves, stems, and berries. Symptoms: Body weakness, blurred vision, vomiting or nausea, abdominal pain (lower stomach), irregular heartbeat (or slow), low blood pressure, drowsiness, and convulsions. Toxic Dose: Children sometimes eat the berries leading to mild to severe stomach ache. The Viscum genus is more toxic than the Phoradendron genus. Reactions following mistletoe ingestion are very variable, serious toxifications are rare but even fatal poisonings have been reported for both human and pets.